With the cost of turnover ranging from $2000 to 200 percent of annual wages, recruiting and retaining top talent matters. Great companies recognize this and use onboarding as a tool to create a competitive advantage to recruiting, developing, and retaining top talent. First impressions can be lasting impressions. Getting started right with new recruits is vital to establishing a successful employment relationship. Establish a recruiting system that is efficient, professional, and responsive. A good electronic system provides an employer with the ability to automatically respond to applicants, maintain a scoring system, set up interviews, and make professional offers. Data collected here should also feed directly into the onboarding system. Utilize a well-thought-out and thorough electronic onboarding system. As discussed below, a quality electronic onboarding system has numerous benefits to help bring on new employees. Send a company-wide email introducing the new employee prior to the first day. This small introduction shows coworkers that you value new employees and lets them know to welcome the new employee. Personally introduce the new employee to coworkers. 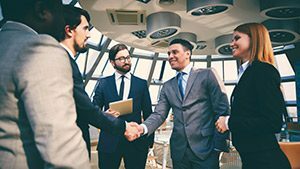 Making an effort to introduce new hires to each employee within the organization demonstrates to existing employees and new hires that they are a valued part of the team. It also helps to foster collaboration from the very start. Have the employee’s workspace/office/desk prepared in advance. Having IDs, badges, business cards, computer/software logins, email, supplies, procedure manuals, and other necessary work items prepared further demonstrates appreciation, professionalism, and work expectations. Provide the new employee with a gift basket. Give new employees a gift basket with company gear, a gift card to their favorite restaurant, their favorite snacks, etc. This serves to show appreciation as well as reinforce the company brand. Information about the employee’s likes should be collected in the electronic onboarding system before their first day. Breakfast with the CEO. Nothing makes an employee feel more important than the attention of the CEO. This is a great opportunity to let a new employee know they are important from the highest level of the organization. It is also an opportunity for the CEO to share the company’s history, values, culture, and mission. Don’t forget the new employee on day two and beyond. Maintain a structured and full schedule for the employee’s entire first week. Have an established and well-prepared training program. Employers should identify specific job skills and knowledge needed for an employee to be successful in his or her position. A training program to help support and build on skills and knowledge is vital to a successful employment relationship. Establish a mentor for the new hire. Good employees appreciate an employer who trusts them with new employees. New employees find comfort and confidence in these relationships. A good mentor, in addition to their teaching role, will further communicate the company’s values, culture, and mission. They will also provide introductions to other coworkers, vendors, and customers that will help get the employees engaged in their new environment. Create an opportunity for employee feedback and monitor progress in the first few months of employment. Feedback from new hires is vital to improvement. A feedback program that gathers information at specific intervals such as two weeks, 30 days, 60 days, 90, and 180 days can provide invaluable information on potential improvement opportunities. Set expectations of a professional organization. Great employees want to work for great organizations. A quality electronic onboarding system will communicate to new employees that they are joining a great organization. Establish expectations of duties and job performance. An electronic system will provide the new employee with a thorough job description and outline of other important job information such as business hours, the dress code, safety information, and more. Additionally, it will communicate the company culture and mission and how the employee fits into that mission. Efficiently track applicants and collect new hire data. Paper onboarding is slow and redundant. Nothing can be more frustrating to a new employee than writing their name, address, phone, and social as many as a dozen times. An electronic system will reduce that to typing them once. Employers can also use this opportunity to get to know their new employee. 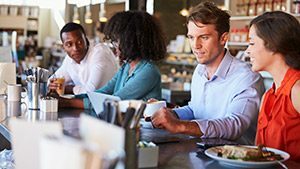 Questions about their favorite restaurant, hobbies, and interests can help an employer tailor any employee appreciation efforts. Ensure compliance. Employers are required to have employees complete a large number of forms with proper completion and signatures on each. An electronic system will ensure each form is completed, signed, and maintained for accessibility. Communicate Benefits. Properly communicating benefits is essential. A quality benefits offering is worthless if employees don’t know about it. Additionally, not properly communicating benefits can put an employer on the hook for coverage. An electronic system will ensure new hires are aware and document it. Make better use of an employee’s first day. The last thing a new employee wants to do on his or her first day of employment is sit in the conference room alone completing an endless stack of paperwork. That paperwork can be completed online prior to the first day. Additionally, it can go much faster when all the basic information only has to be entered once. Want to transform your recruiting and onboarding program from a liability to a competitive advantage? Contact ESS to establish a successful onboarding program for your organization. Website Design and Build by Catapult Creative Media Inc.